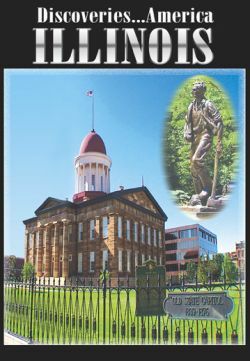 The land of Lincoln, Chicago, Route 66, extreme sports park, Frank Lloyd Wright, Joliet's historic Rialto Theater, iron sculptor, Lincoln attractions in Springfield, historic Galena, archeology, Superman's home of Metropolis, Garden of the Gods and President Regan's boyhood home. Shopping along Michigan Avenue, an afternoon with the Chicago Cubs at Wrigley Field or a visit to the new Millennium Park�these are just a few of the locations visited by the �Discoveries-America� crew as they pass through Chicago, the third largest city in the United States. Take a look inside of Frank Lloyd Wright�s home and the surrounding neighborhood of Oak Park where he lived and worked. The Rialto Theater in Joliet is an amazing monument to the vaudeville tradition of the 20s. Almost torn down in the 1970s, it was refurbished to the tune of 6 million dollars including the original organ. Challenge Park Extreme is a 24-acre park dedicated to extreme sports. The facilities include several different paintball environments, an unusual mountain bike course and a skate park. More than 85% of the buildings in Galena are on the historic register, making it one of the most unique tourist destinations in the state. A trolley ride through town brings visitors to the home of General Grant and other important sites. In rural Illinois, metal artist Bob Cumpston creates delightful sculptures. Zebras, giraffes, llamas & monkeys are just a few of the animals one can find in his yard, and they never need to be fed. The capitol of Springfield is the heart of the land of Lincoln. Passage through the area includes a visit to the Abraham Lincoln Presidential Library and Museum, the beautifully restored state capitol building, historic New Salem and Lincoln�s Tomb. America�s favorite highway passes right through the middle of Springfield. One of the icons of Route 66�s greater glory, Bill Shea�s Gas Station & Museum has a unique collection of Route 66 memorabilia. Another Springfield original is Cozy Dog, home of the original hot dog on a stick. In metropolis, Illinois, a giant 15-foot bronze statue of America�s favorite super hero watches over the city and the entrance to the Superman Museum. The museum has a 3 million dollar collection of memorabilia celebrating the various incarnations of the man of steel.